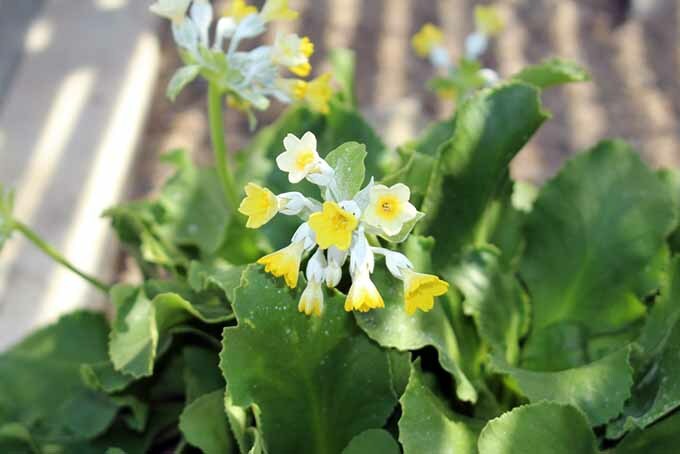 One of my most cherished memories as a gardener is from the 1960s, when I first set eyes on a green Primula auricula – common name mountain cowslip, and a close relative to primroses. This happened to be at an auricula show, though it was more of an informal garden visit with the horticultural college where I was attending evening classes. An elderly lady, who owned a humble garden, nevertheless had an unbelievable collection of alpine plants in her small greenhouse. Before then, I had no idea that green flowers existed. And that very moment was the start of a love affair with these interesting plants that still continues today! Besides primulas, there are many other cultivars and specimens out there. The more different varieties that I found out about, the deeper my love and appreciation for them grew. 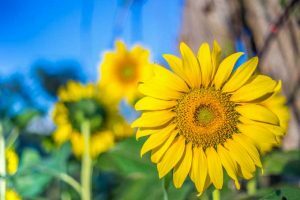 Now, I get to share them with you and tell you all about them, all within this wonderful article – not just to sing their praises in terms of how much I appreciate their beauty, but also to share some tips on care, maintenance, and even a little history. 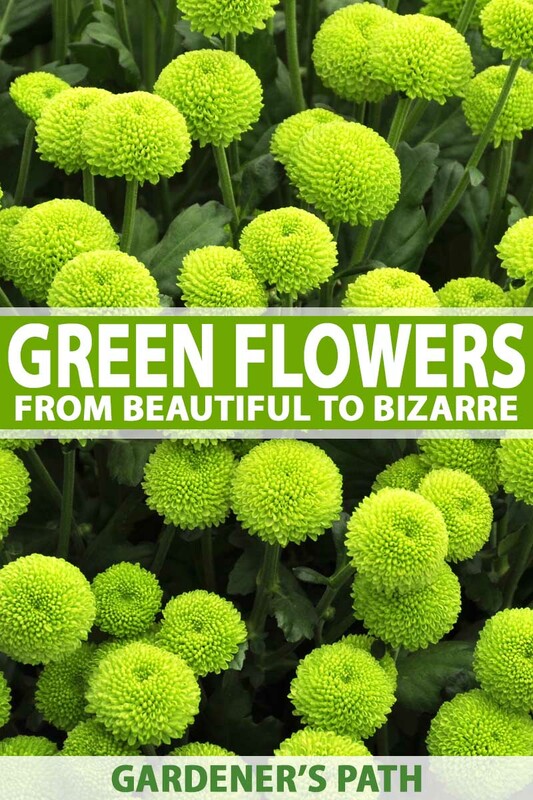 Ever seen or heard of green flowers? If you haven’t, you’ll soon learn a lot about them. So read on – let’s get started! 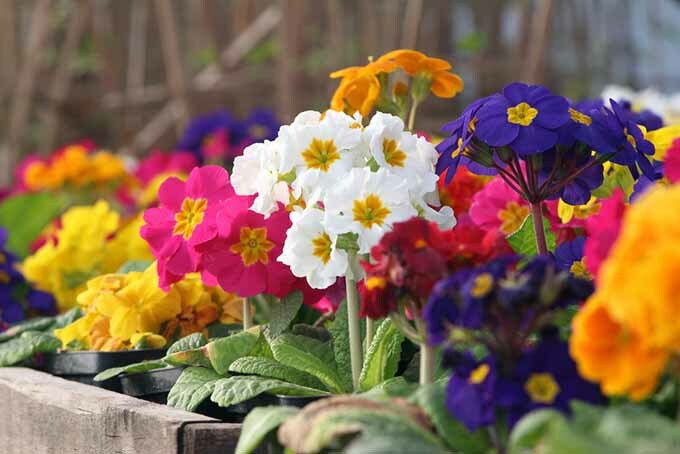 Primroses come in a variety of types, ranging from hardy outdoor varieties that survive most anything, all the way to fragile show types limited to pots for protection from the weather. 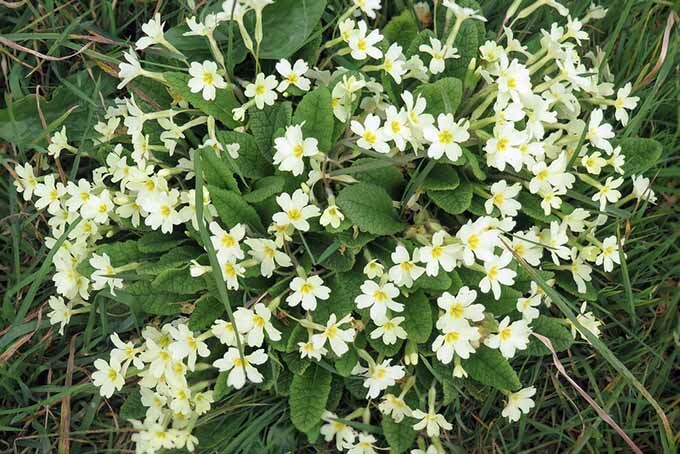 Primulas, the flower I first mentioned at the beginning of this article, are just one genus of the enormous primrose family, which is well-known for some lovely trademark green flowers! This genus includes more specific species like P. vulgaris, auricula, and many others. The plant family name Primulaceae comes from the Latin for “first,” and there are about 70 genera and 2,500 species. Primulas and primroses are thus named because they flower so early in the year. 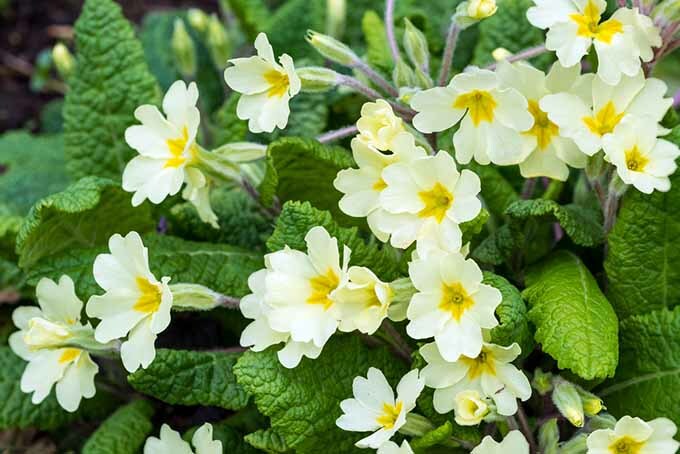 Primroses are truly the epitome of spring. Depending on your location, they can flower as early as February and onward. Since there are nearly countless varieties of garden primulas, you can bet that they’re readily available in garden centers and nurseries – and some are famous for their green blooms. One of my favorite green kinds of P. vulgaris is excellent for continuous flowering: Primula ‘Green Ruffles,’ which prefers a light or dappled shade. Most primulas like to be in moist but well drained soil, but Green Ruffles has flowered brilliantly for me completely unsheltered, and with very little soil maintenance! Another green primrose variety, called P. ‘Viridis’ or the green-flowered primrose, is quite a rare treasure. It is known to be difficult to cultivate, but there are countless beautiful versions of this primrose – not just in green, but in many other colors, like the purple P. ‘Wanda’ for example. We can probably agree that this genus is wonderful, whatever the color! Want to grow your own green primrose blossoms? You can either seed them yourself, or get new plants from divisions. 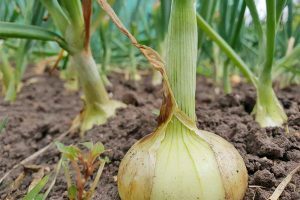 The seed is best sown in September, and should not be covered with compost or soil, as these need a lot of light to germinate. 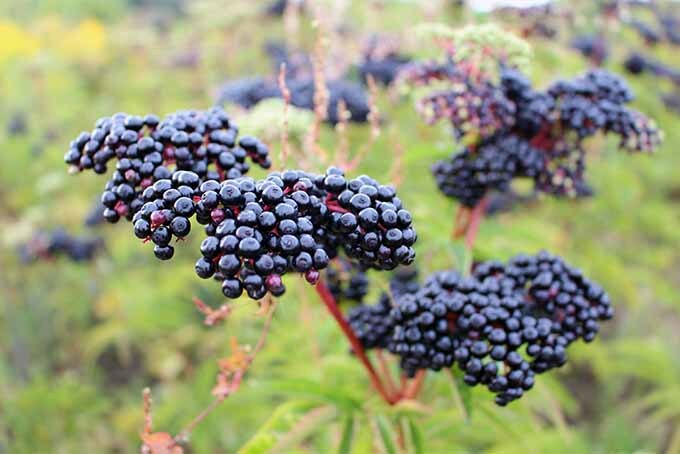 Likewise, if you are dividing existing plants or putting new purchases in the ground, September is the best time. This allows them to get established before the worst parts of winter arrive, and readies them to show their faces again in the spring. Over the years, people have tinkered with primroses to produce an amazing range – but none has caused more enthusiasm and devotion than the auricula! While we have touched on primulas (like P. vulgaris), there is one type that deserves a category all its own: auriculas, of the species P. auricula. And yes – some of these have brilliant green petals when they flower! 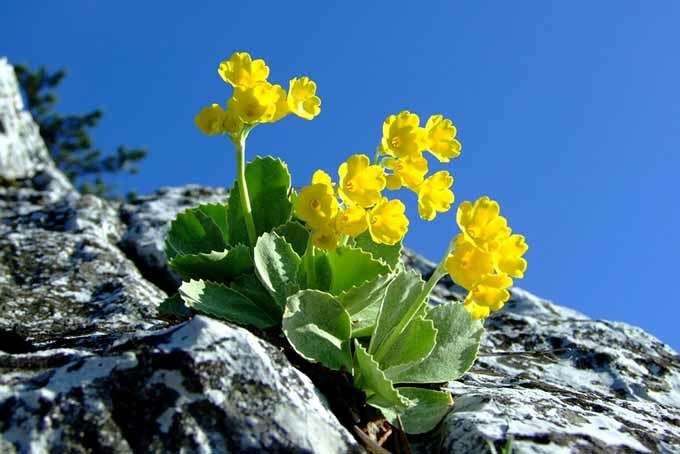 While P. vulgaris consists of today’s breeds originating from a wildflower ancestor, auriculas are like their alpine cousins, derived from a much hardier version of the common primrose that once grew in mountainous regions. 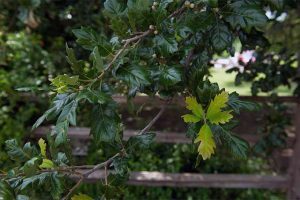 Their leaves are smooth and thick, often covered with a white powder (called a farina) to protect them from the intense light found at high altitudes. These flowers were admired and taken up by eighteenth and nineteenth century florists, who developed the versions that are displayed today for competition – and which once were cultivated primarily for royal gardens! Auriculas are split into two different categories based on hardiness: garden auriculas, and show versions. 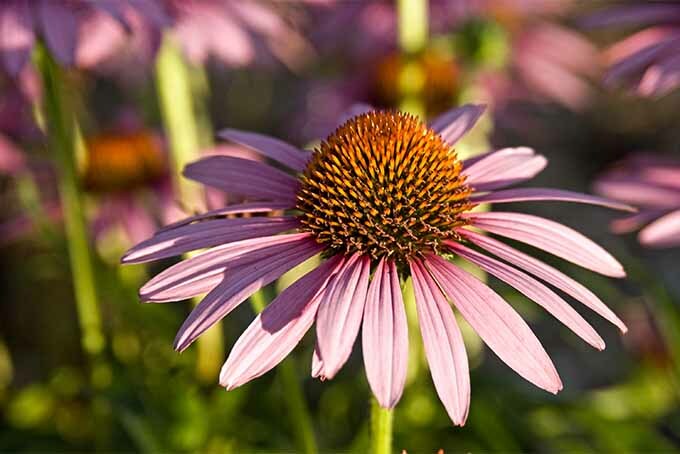 The garden types can be planted outdoors and tolerate a year-round cycle like most perennials, while show types must be grown in pots, for indoor protection from the weather. What helps to distinguish show varieties from garden types? The former tend to have that distinct circle of white, fuzzy farina at the center of each flower. You won’t see that so much among garden varieties. I know I am digressing from the green flower theme just a bit, but I must pause here to tell you the story of Barnhaven. This tale originates in Oregon, with a lady called Florence Bellis. An out of work piano teacher, she was forced to move at the time of the Great Depression to a dilapidated barn that belonged to a friend. And she fell in love with the place. It was her haven – hence the name – and after arriving she spent her last five dollars on a packet of primrose seed. 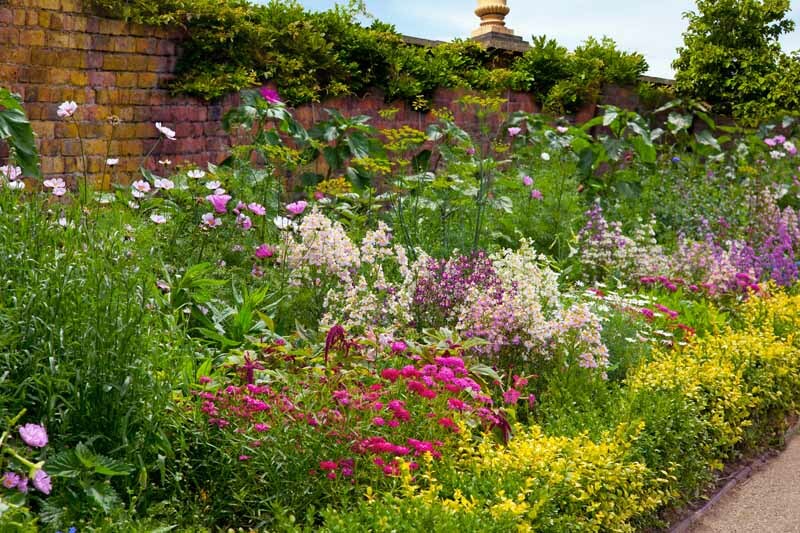 These particular seeds were selected from strains bred by Gertrude Jekyll who grew them in her garden in Surrey in the late 1800s. Several garden companies began offering her special varieties for sale. The results of Bellis’s own plant breeding on the property, done through hand pollination, became world famous. 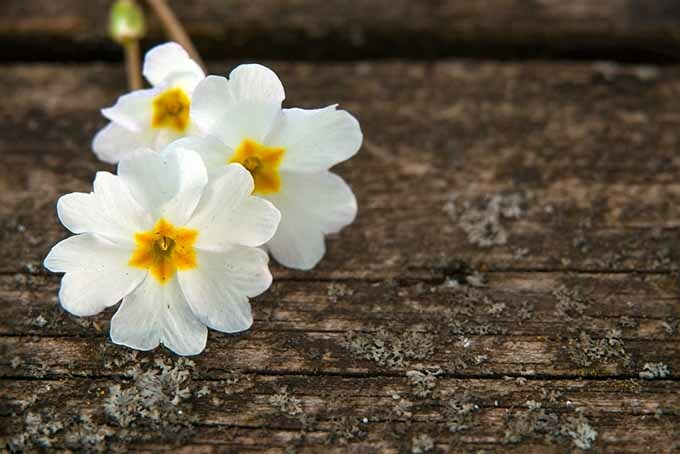 Over 30 years of primrose breeding later, when she was no longer able to continue, she sent the seed to Jared and Sylvia Sinclair in England with the instruction, “Yours to keep or kill.” The Sinclairs continued Bellis’s work for the next 20 years. When the Sinclairs could not continue either, the business was moved to Brittany, France by Angela and Keith Bradford, a librarian and her husband, and then taken on by others after that. All of these people have continued to select and breed in the way that Florence would have wanted. I just love the history of these beautiful plants and the stories of the people who grew and developed them, you know – almost as fascinating as the beautiful blooms themselves. Sometimes referred to by their common name, bear’s ears, garden auriculas are hardy and will usually grow in any good garden soil. They prefer a pH level that’s neutral to slightly acidic. 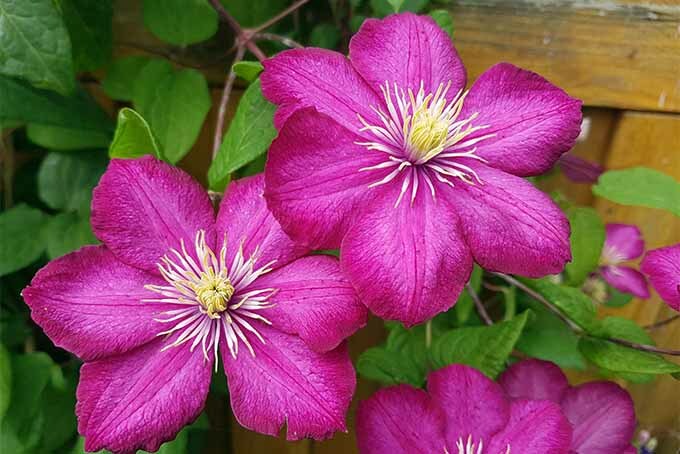 They also do best in well-drained soil, and appreciate some shade from the midday sunshine. Keep in mind that the garden varieties are fairly easy to cross pollinate! While you may find yourself a nice green-flowered auricula, if you have varieties of other colors on the premises, beware that your chosen green blossom could be bred out in time. Auriculas, in all colors of the rainbow. Even though you might not be able to produce the wonders of the famous auricula-breeder Florence Bellis, it can still be fun. And you may even be rewarded with the superb feeling of finding that your own unique breed of auricula has developed in your garden over time. 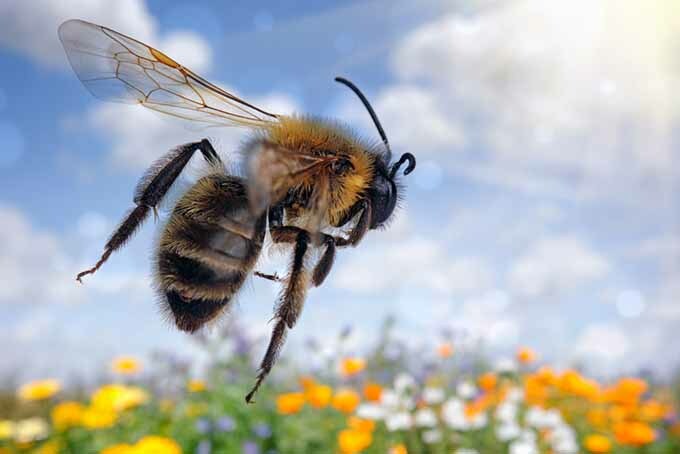 If you let a few different varieties cross-pollinate and reproduce when left to their own devices, you might be in for some new surprises in the years to come! If you want to keep green blossoms, however, avoid planting primrose varieties of other colors in your garden. Unlike the garden varieties, show types must be kept in pots for easy transport indoors and outdoors. Terra cotta is a great choice for their containers. While they are hardy like garden types and don’t mind cold, they must still be sheltered from wet weather especially. Choose a soil mix for these plants that contains grit or other soil aggregates to provide adequate drainage. Further, bouts of rain can wash away that powdery-white farina on the flower – what’s considered a very important visual aspect of the breed, especially for showmanship. On that subject, show type auriculas are incredibly popular for exhibitions! They are often displayed in what are called auricula “theaters,” large shelf-like structures built historically on the grounds of royalty and the wealthy to both shelter and display these green floral delights, protecting them from the rain permitting them to flaunt their beauty. These theaters are almost like outdoor bookcases, showcasing beautiful blooms while both sheltering them and bringing in healthy airflow and sunshine. Displaying them this way was a popular fad at large country houses in the British countryside during the eighteenth century. Auriculas are usually propagated by removing the offshoots or volunteers around them; that is, digging up small plants that grow up alongside the parent, and potting them separately. 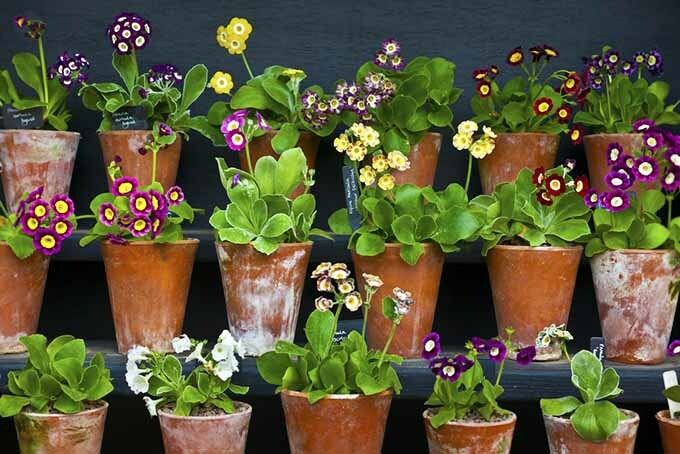 Getting new auricula plants going – or selling them, or gifting to friends as well – is most commonly done this way. For some basic tips on doing this successfully, feel free to check out this excellent guide from Auricula and Primula. You can also start them from seed, if you feel so inclined. But do beware: auriculas do not come true from seed, meaning seeds that you plant (even those from a green-flowered variety) will likely give you a variety of very different-looking offspring! Some may be green, but you’ll get lots of other colors in there as well. This is exactly why repotting offshoots is the more popular alternative, especially if you want to grow your collection of emerald-blossomed varieties! Another alpine primula, P. marginata, a close relative to the auricula. These also have the fleshy leaves and white powdered farina covering. These were potted up last spring, and are now beginning to flower. Photo Credit: Sheila Muckle. My first passion, floral art, was what eventually brought me to my second passion: gardening. In search of foliage and types of flowers that were not available in shops, I was hard pressed to grow my own to make up for what I could not find – particularly when I went in search of green flowers! 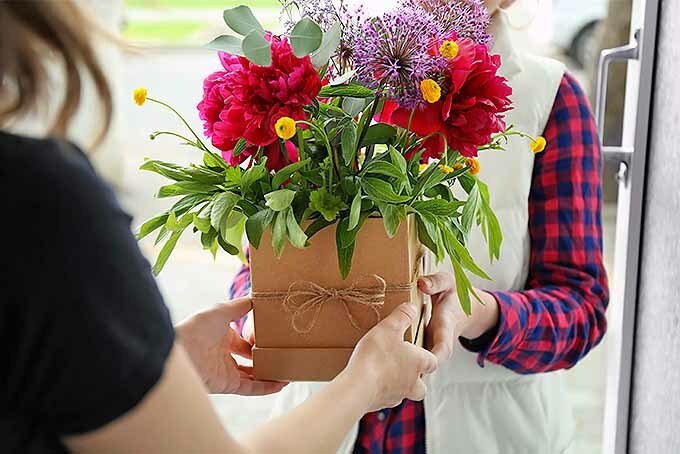 This situation has changed over the years, and many flower shops have responded to increased demand for green flowers, especially for weddings. Why? Because they pair so well with white! Today, you can now find vivid green chrysanthemums and ‘Green Woodpecker’ gladioli without too much trouble. But nothing beats flowers that you can cut from your own garden – these are the ones that really add some character to your arrangements. 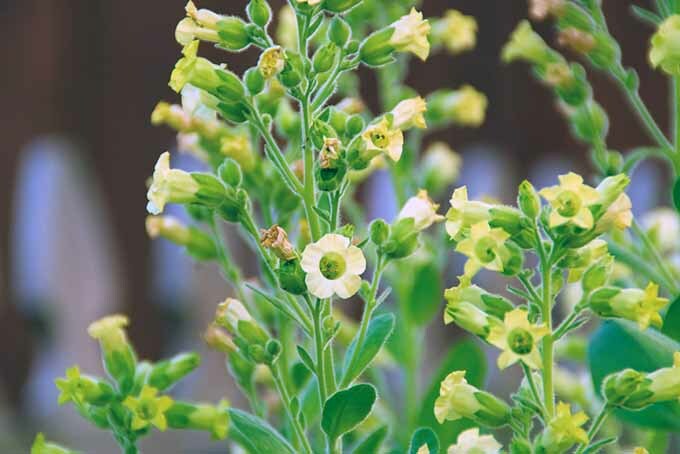 Green nicotiana, or green-flowering tobacco, is a great case in point. 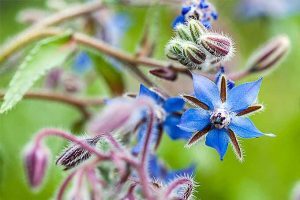 Easily grown each year as an annual from a simple packet of seeds, these can be raised by simply scattering the seeds on worked soil. 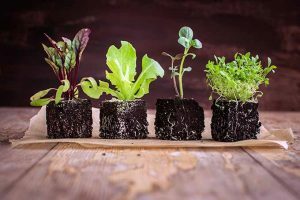 However, you’ll achieve better results if you sprout them in a seed pan covered only lightly with any type of good seed compost or fertilizer. To water your seeds, just place the tray in a slightly larger-sized dish of water to soak up the moisture, instead of watering from overhead. This will prevent the seeds from washing about. 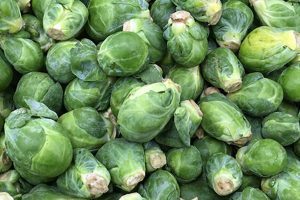 If you can cover them with a thin plastic cover, or even slip the tray into a plastic bag and place it on a windowsill (if you don’t have the luxury of a greenhouse), this will add a little heat and help to speed germination. The windowsill or greenhouse position should not be full sun, because you do not want these seeds to dry out too much. On the other hand, it’s a good idea to remove any condensation that builds up inside the cover to help prevent mildew or rot, at least once per day. When the seedlings are big enough to handle easily with your fingers, transplant them into bigger, deeper containers so they can grow more in size. This is what I liked to call “pricking out,” when tiny plants are moved into another tray where they will have more room to grow. These seedlings should always be handled by gently pinching or cradling the stem underneath the leaves. Never pull out, pinch, yank, or hold a seedling by one leaf alone, or by its roots. 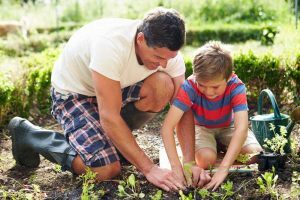 Use a small stick (also called a dibber, dibbler, or dibble) or even a pencil to make a hole in your prepared new compost or soil. Gently drop a seedling into each hole made by the dibber, and pat soil around it gently until the plant is in place. Water the finished tray lightly, keep it in a spot with partial sunlight – and watch it grow! These flowers are wonderful for garden borders, and very useful as cut material to add to arrangements. 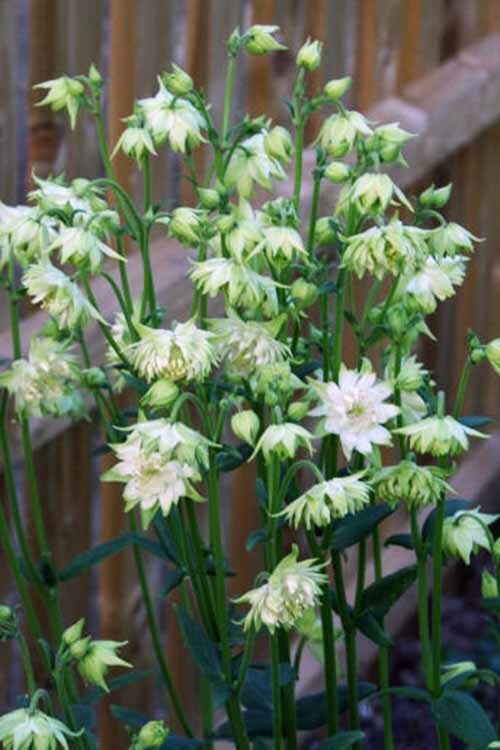 Another brilliant green flower addition to your border that can be grown from seed is Acquilegia ‘Green Apples,’ also known as columbine. 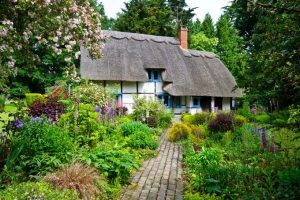 These delightful cottage garden flowers – sometimes lovingly called granny bonnets – seed themselves, and the purchase of just one plant will guarantee you plenty of seedlings in the future. Acquilegia ‘Green Apples.’ Photo Credit: Sheila Muckle. They like a fairly well drained position, but will grow in most conditions quite happily. Like nicotiana, these are reliable for use as cut flowers, and mix well in the border or flower arrangements. 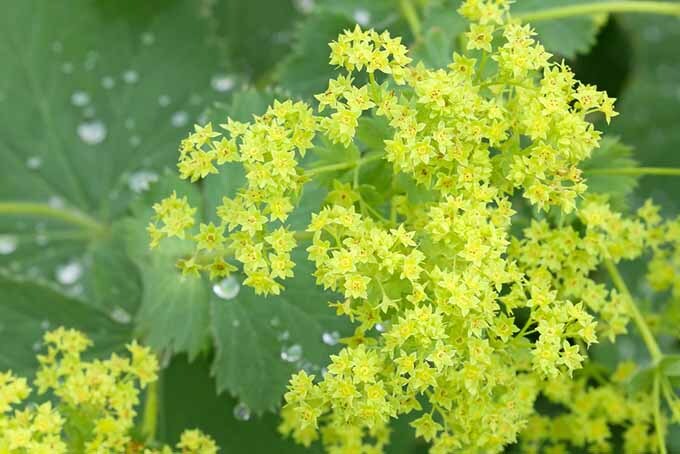 Another supreme plant for cutting and arrangements, as well as for filling the garden with a splash of acid-green contrast: Alchemilla mollis, or the handsome lady’s mantle. This garden treasure is totally hardy, but it can be a bit of a takeover plant if it’s not watched closely! Lady’s mantle with green flowers. Seeding itself generously, lady’s mantle will find all the little nooks and crannies where you would never have expected plants to grow. Crystal drops of water collect like little beads of mercury on its leaves after rain – and in times long gone, these were thought to have magical qualities. 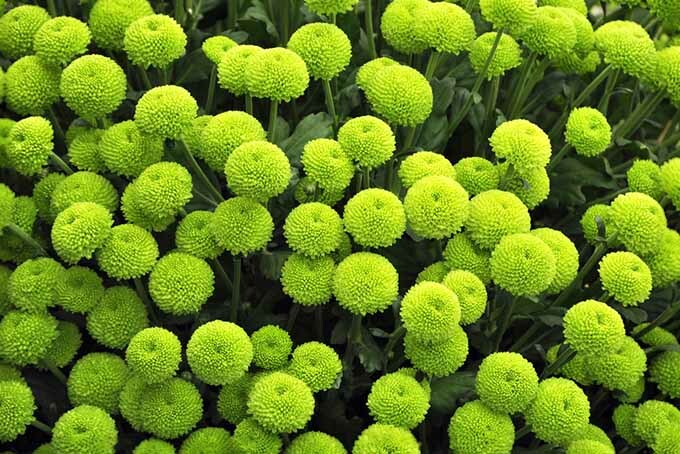 But the most magical thing of all is definitely the sharp lime green color of the flowers. It’s a wonderful foil for almost any other color in flower arrangements! Many years after my first encounter with green flowers, I was teaching floral art and met a lady who became a close friend. 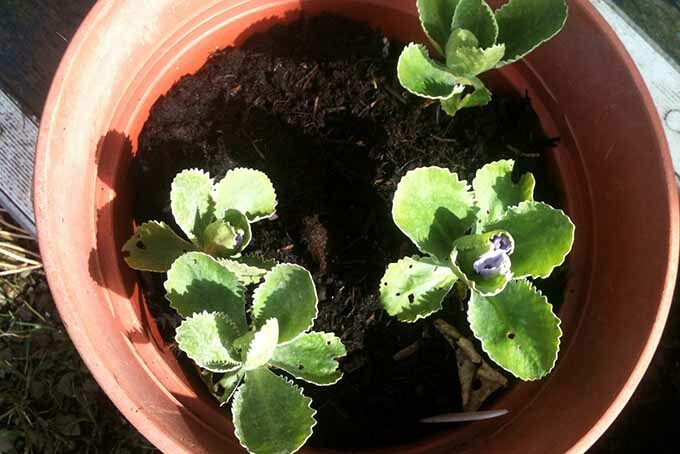 She was an excellent gardener, and turned out to be the niece of the elderly lady whose garden inspired me – the auricula grower mentioned earlier in this article! My new friend had saved many plants from the estate of this aunt of hers, and one of them happened to be the fascinating Plantago ‘Rosularis,’ or the rose plantain. This green flower is likely a favorite for the collector of plant curiosities, with its strange, fractal-pattern green blossoms. Yes, you guessed it – it is related to the common plantain weed you’ll find overtaking yards the world over. 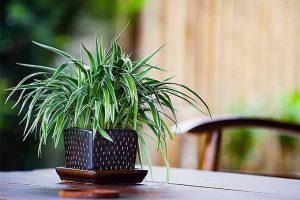 It is only around eight inches tall but very hardy, and provides seedlings aplenty like its wild cousin – though not as much to be a nuisance. The flowers look like a rounded version of its wild relative as well as its more domesticated cousin, P. rubra or the red plantain. The purple version of P. rubra, with the more normal-looking flowers. Photo Credit: Sheila Muckle. 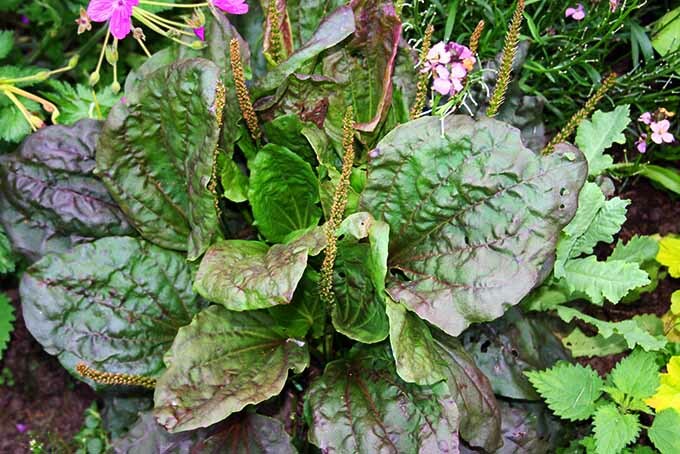 A dark red garden variety, red plantain has handsome leaves, but does seed itself prolifically, and has the more recognizable flowers similar to wild plantain. It is well worth it to remove the dying flowers from the plant, just for the sake of keeping that striking scarlet foliage! There are green cultivars of P. rubra, which almost look fasciated, a botanical term for wrinkled leaves. This is where a chance change occurs, and the shape of the the growing point in a plant changes. No worries, it’s not a disease: this look is normal to the breed. The stem may also look flattened and coarse, while the flower might grow into more of an odd fan shape. As this plant comes true from seed, this is unlikely to happen, but still possible. 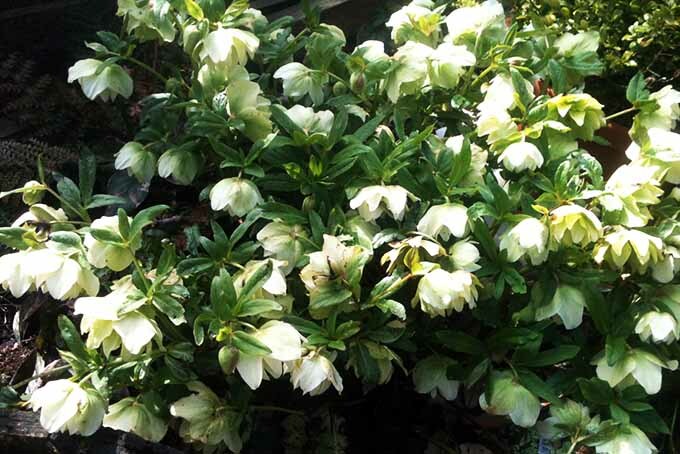 Hellebore is a striking plant of green flower fame. But interestingly, what you would think are the petals of the hellebore flower are not actually petals at all – they are sepals, or a modified version of leaves. As such, it is not surprising to find hellebore with green blooms at all! The wild ancestor of garden hellebore, Helleborus foetidus, is a tall plant with naturally green flowers, each tightly curled as it waits to open. They look a little like tiny green apples. Hellebore likes a shady, damp spot in the garden, but cheerfully looks after itself for the most part, with little maintenance required year after year. 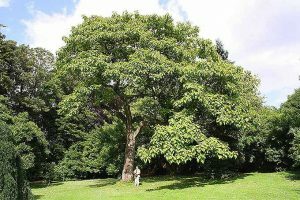 Over the last twenty years, enthusiasts and experts have bred some wonderful hybrids by crossing the wild versions with older domestic hybrids – and some of these crosses now widely available. The dark purple and almost black hybrid varieties are the most eagerly sought, but the lime and pale greens are just wonderful, in my opinion. 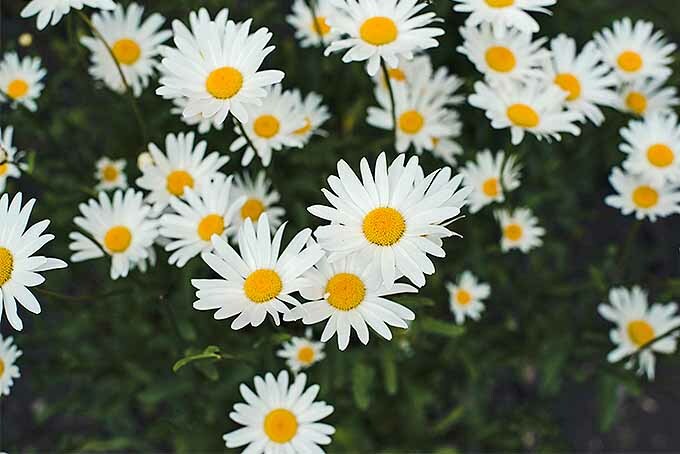 There are double flowered varieties available as well, with each variety settling and adapting well into most gardens, and giving you that special sense of joy in the earlier part of the year. Some of these hybrids look almost too exotic to survive as they do. But the double flowered green in my garden has been flowering profusely since February! A good job to do for your green-flowered hellebore at that time of year (i.e. February and onward): remove any damaged or diseased leaves, to tidy up the plant’s appearance, and boost its health. 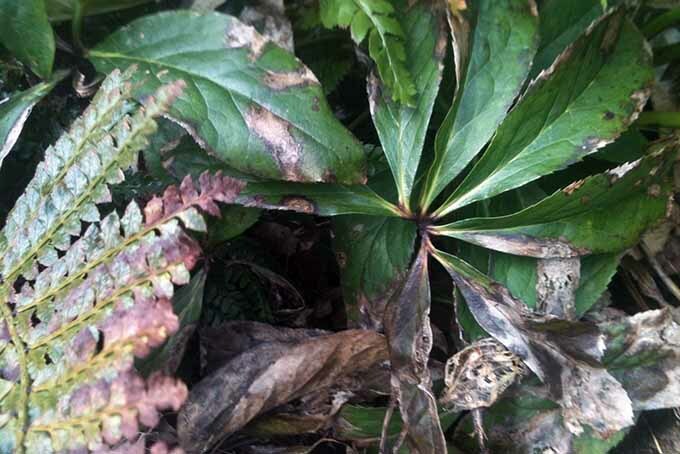 When your hellebore leaves look diseased like this – it’s time to remove them! Photo Credit: Sheila Muckle. Remember that it’s much more sensible to trash any diseased leaves rather than add possible disease to your compost heap! 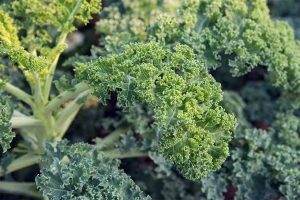 You don’t want the diseases you work hard to keep away from your plants to return effortlessly when you amend your soils. Hellebore’s green blooms are not the easiest to use in flower arranging. 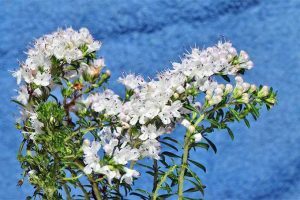 But the longer they stay on the plant, the easier they are to condition for arrangements, and the longer they will last. When you notice that the center of the flower has been pollinated and turns into a seed capsule, then you know that the blooms can then be relied upon to stand well in arrangements. Hellebore’s green blooms are tough, and they do brighten up the early spring months. But at the other end of the spectrum are more exotic green flowers. 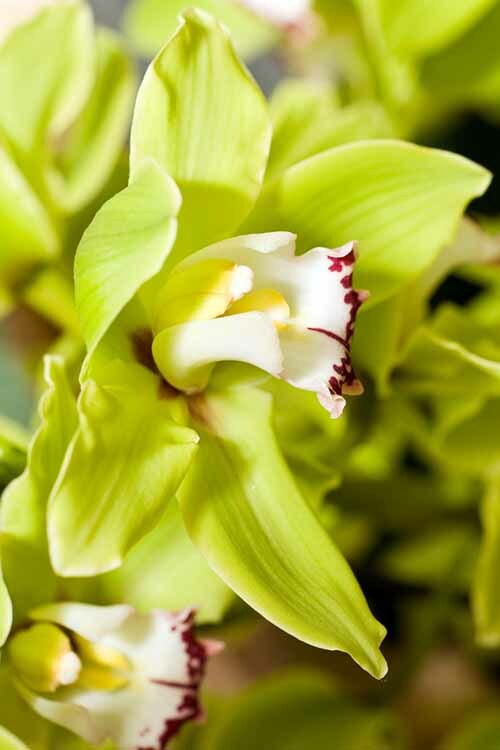 Cymbidium, for example – also known as boat orchids – are among the most fabulous of houseplants, easier than you would think to look after, and some boast stunning viridian plumes. Orchids in general are rapidly taking their place as the most popular house plant on the market. As methods have been developed to produce these in large numbers, prices have become more reasonable with time, and they are much more readily available nowadays than they once were. Sadly, a lot people kill their orchids with kindness: by over-watering! Cymbidiums simply cannot survive with their roots in watery, damp soil. 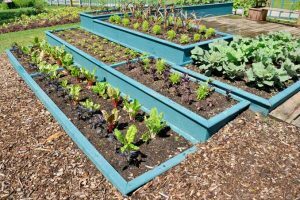 It’s true that they do need a thorough watering about once a week, but take note that the water must be allowed to drain away completely through a very open, aggregate-rich, humus soil. In fact, the best soil to plant them in is often just comprised of pieces of bark, which they really enjoy. This mimics the natural surroundings of most species: many are suited to a forest floor cluttered with fallen tree bark or branches, while some kinds even grow right on the branches of trees, with no soil at all! 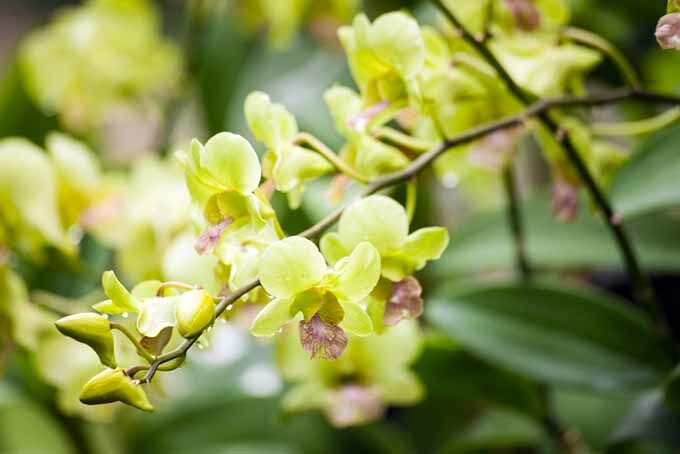 In fact, you can actually grow orchids right on trees yourself at home! I’m a bit of a sucker for beautiful orchids, especially those with green flowers. I simply cannot go past a display in the supermarket or garden center without buying at least just one. They are an addiction! But I am in fact addicted to all of my green flowers, really – and I plan to go on collecting many more, for a very long time. Hellebores, auriculas, orchids… you name it! There are so many green flowers out there, and I really can’t get enough of them. I hope that my passion for this interesting class of flowers has inspired you, and that the bug has bitten you, too. What green flowers interest you the most? Have you seen any interesting breeds, cultivars, or species before that I haven’t mentioned in this article? Which are your favorites? 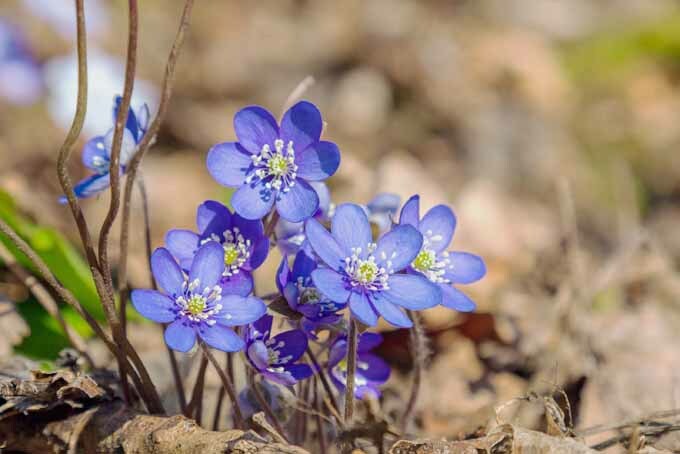 Are you an expert on green flowers yourself – and have some wonderful tips or secrets to share? We’d love to hear from you! Please don’t be shy about commenting below. 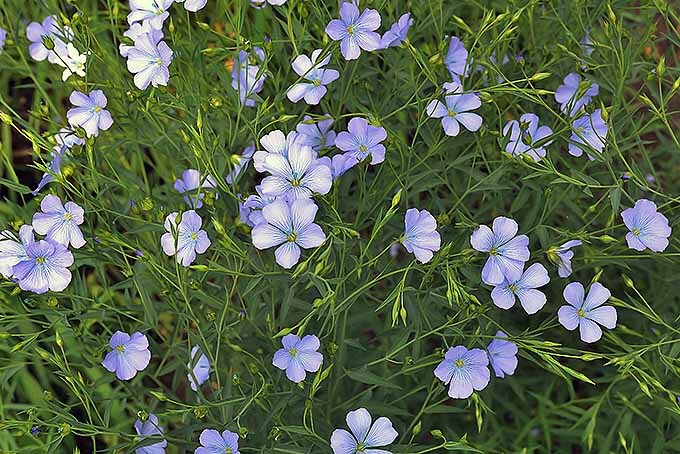 And if you’re more into a different hue, check out our post on native blue wildflowers.